Today is the launch day for NetherRealm Studios' Injustice: Gods Among Us in North America. There are numerous special events going on, mostly lots of game store midnight releases. Here's a few of the notable upcoming events today. First off, there will be a live stream of the Injustice Launch event from LA Battle Arena Live Finale at 7pm PST. At the event will be the live unveiling of the final winner of the Injustice Battle Arena. Who will win Batman or Superman? We will find out then. Also as part of that event they'll be announcing the first DLC character who is part of the Season Pass. There are lots of theories of who it'll be, but nothing announced as of yet. Leave your ideas in the comments below. When it's live, you can stream it directly via the Injustice Game channel on Twitch.TV! Those who can't attend that check out our list of major Injustice Launch Events that are happening tonight. Our friends at Galloping Ghost Arcade in the Chicago suburb of Brookfield is doing an Injustice Launch Party & Tournament all night tonight, until 4:30am. Also it will be the debut of their custom made Injustice Arcade cabinet. I'll be swinging by there tonight so be sure to follow us on Twitter for pictures of the event as well as watch the Galloping Ghost Twitch.TV Channel for streams of the fights being featured. 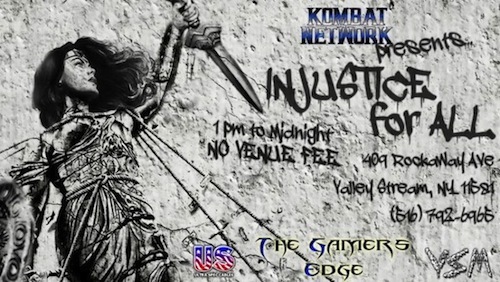 9.95, of the Kombat Network, is throwing a big Injustice For All Release Party and Tournament at the Gamers Edge in Valley Stream, NY. This event will also be streamed on Kombat Network's Twitch.TV channel. Tim Static, also of the Kombat Network, is hosting a GameStop Tournament at the Morse Road Plaza GameStop in Columbus, Ohio. It's located at 1704 Morse Rd. Doors open at 10pm. Don't see your event listed? Reply in the comments with your event and we'll update this post later this afternoon with notable events. We have heard numerous GameStops are also holding events, so call ahead to see if yours is or not. How do we win a free copy of the game from the live stream? Do we have to Tweet something on Twitter?